Substance abuse encompasses a harmful pattern of use of alcohol, tobacco products, and illicit drugs; this includes the presence of substance use and trade within school and campus environments and during school-related activities. The use of alcohol, tobacco, and other illicit drugs undermines students’ ability to achieve academically, is associated with other harmful behaviors, and is incompatible with a school climate of respect, safety, and support for learning. While the majority of students do not use alcohol, tobacco products, or illicit drugs, disengaged students are more likely to be users. Research shows that, among students in eighth to twelfth grades, majorities report they did not use alcohol, tobacco products, or illicit drugs during the past 30 days. Students who are disengaged in school are more likely to be users. In contrast, students who plan on completing four years of college are much more likely to avoid using alcohol, tobacco, and illicit drugs. For example, among eighth-graders, students with college plans are more than four times as likely as those without to be substance-free. Alcohol is by far the substance most abused by students. Most students do not drink; however, those who do are likely to be “binge” drinkers—consuming large quantities of alcohol specifically to “get drunk.” Binge drinking is associated with poor school performance, and involvement in other health risk behaviors, such as riding with a driver who has been drinking, cigarette smoking, sexual activity, being a victim of dating violence, attempting suicide, and using illicit drugs. In 2010, nearly a third of all traffic deaths among young drivers ages 15 to 20 were alcohol-related. Consuming larger quantities of alcohol is also associated a risk factor for cancer among young women with benign breast disease. Among illicit drugs, marijuana is by far the most commonly used by young people. Cigarette smoking rates among middle- and high-school students have fallen by more than 50 percent over the past 15 years. Reducing rates of cigarette smoking among teens has been one of the greatest public health success stories of recent times. However, some teens may not realize that more recently promoted forms of tobacco—such as small cigars, lozenges, or hookah pipes—carry health dangers equal to or greater than those associated with cigarettes. Helps practitioners conduct fast, effective alcohol screens and interventions with patients, even during brief, acute care visits. Offers empirically derived tools, tips, and resources and outlines different levels of intervention with tips for topics to cover. Presents an initiative, developed by the Drug Enforcement Administration (DEA) and Discovery Education, that aims to combat the nation’s opioid epidemic by educating students about the science behind addiction and investigating how a public health epidemic impacts a community. This website houses all the materials associated with the initiative. Contains practical steps that community leaders and faith-based organizations can take to bring hope and healing to the millions suffering the consequences of opioid abuse disorder. Addresses the most fundamental and essential questions about drug abuse, including tracking emerging drug use trends, understanding how drugs work in the brain and body, developing and testing new drug treatment and prevention approaches, and disseminating findings to the general public and special populations. Includes parent & teacher and teen portals and resources. Synthesizes the lessons learned from experimentally evaluated programs and interventions targeting adolescent and youth substance use from the Child Trends database of experimental evaluations of social interventions for children and youth--LINKS (Lifecourse Interventions to Nurture Kids Successfully). 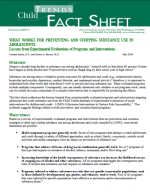 Suggests findings related to both prevention- and cessation-based programs. In 2013, a little more than 1 in 5 youth reported being offered, sold, or given an illegal drug on school property.